If Winooski is the Brooklyn of Burlington, then in an inexact local analogy, St. Albans is the Hudson Valley. But really, it's a place all its own. A half-hour drive north of Burlington and just 20 minutes from the Canadian border, "Snalbins," as it's often colloquially pronounced, is just far enough from the more populated Chittenden County to feel away. 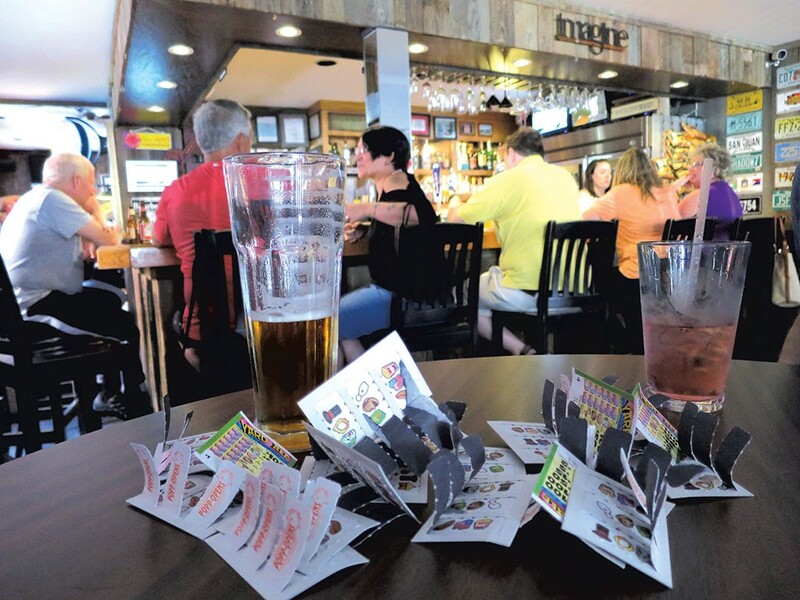 Formally differentiated into St. Albans Town and St. Albans City, the area is small — if not by Vermont standards — and packs a good punch. The city proper covers approximately two square miles, and the 2010 U.S. Census determined its population as just less than 7,000. The town, roughly 60 square miles with a population of 6,000, surrounds the city on all sides. Its westernmost edge meets the shores of Lake Champlain, making for stunning views and great recreating along the bay and in two beautiful state parks. Good things come in small packages, as they say, and St. A has plenty to unpack. Whether your thing is industrial history (the place was dubbed "Rail City" during the height of the train boom) or a passion for maple (it's unofficially the "maple capital of the world"), or you just feel like exploring, there's plenty to do. In the first in a series of travel stories on Vermont towns — and with a tip of the cap to the New York Times series "36 Hours" — we've assembled a loose, totally adaptable itinerary to help you find your own St. Albans groove, three to six hours, or longer, at a time. 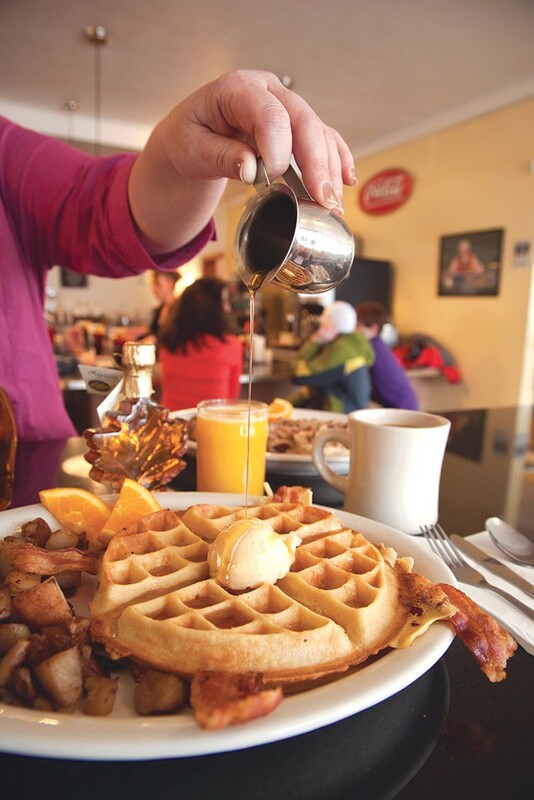 Fuel up for the day at the Maple City Diner, just a wee bit north of the city center at 17 Swanton Road. Opened in 2013 by Marcus and Erika Hamblett, former proprietors of downtown St. Albans' the Old Foundry at One Federal Restaurant and Lounge, this is a prime spot for classic American diner food. The décor serves as a loose crash course in sugaring history, with maple-related ephemera in ample supply. As at any diner worth its salt, breakfast is served all day, so you can circle back later if you need to re-up. Serious coffee folk — or the seriously tired — should not miss Catalyst Coffee Bar at 22 North Main Street. Opened in 2017, the laboratory-themed café prides itself on serving brews from Burlington's Brio Coffeeworks and Winooski's Vivid Coffee Roasters. For the full experience, order a siphon-made cup. Aside from the supposed superiority of this method of brewing, the glowing glass vacuum-pressure apparatus is an attraction in itself. Once you're properly caffeinated, head to the local bookstore, the Eloquent Page, at 70 North Main Street. It's cozy in here, with used and new books for every literary leaning if you're ready to browse. 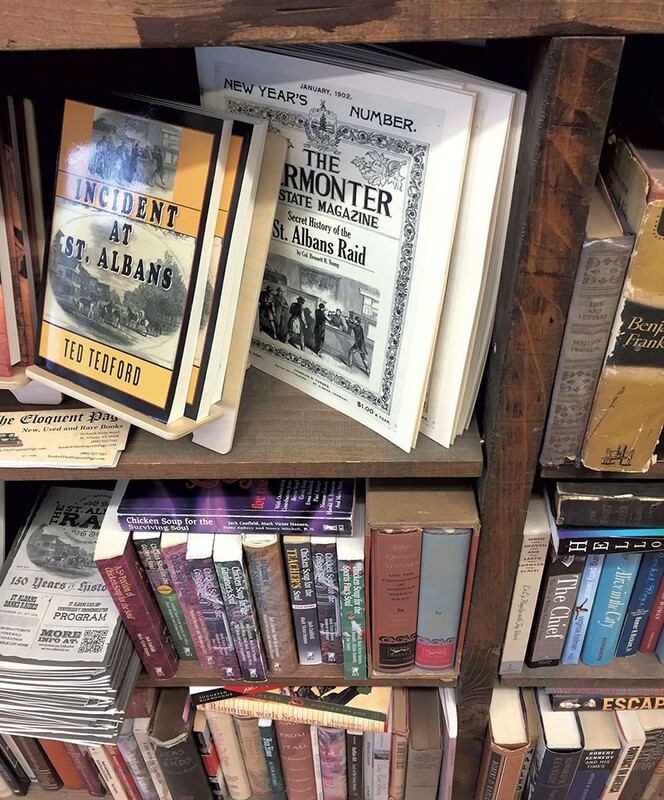 Along with rare books, hundreds of literary novels, and enough trade-paperback mystery and romance to last a lifetime, proprietor Donna Howard stocks vintage maps and postcards. Her assortment of local-interest publications includes a reprint of the January 1902 Vermonter magazine with a write-up of "The Secret History of the St. Albans Raid." There's a little of everything, and don't forget: In the age of Amazon, supporting a local bookstore is practically a mitzvah. Saint Albans Museum at 9 Church Street (open from June 1 to early October) is the go-to spot for orienting yourself in Snalbins, past and present. Built in 1861, the stately brick building operated as a school until the 1960s, and one of the museum's many exhibits is a preserved classroom from that era. The Railroad Room tells the story of the Central Vermont Railway, which made its headquarters in St. Albans in 1860 and would become New England's largest rail network. If you're curious about the St. Albans Raid — and you should be — head to the Saint Albans Room. Here, visitors can dive into the bizarre happenings of October 19, 1864 — an incident involving bank-robbing Confederate soldiers that's considered the northernmost action of the American Civil War. It inspired a 1954 film with Anne Bancroft called, appropriately, The Raid. If the weather is favorable, St. Albans is a beautiful and easy place to be outdoors. For bikers, runners and walkers, the Missisquoi Valley Rail Trail offers a scenic path out of town — and all the way to Richford, 26.3 miles away, if one so desires. With a launch point at the intersection of Main Street and Seymour Road (right next to the Maple City Diner), the wide gravel trail traces the long-defunct route of the Central Vermont Railway's Richford branch through cornfields, past red barns and over bridges. In other words, through quintessential Vermont scenery. A few miles west of St. Albans City lies St. Albans Bay. Drive north along and around the bay to St. Albans Point, and you'll end up at Kamp Kill Kare State Park, which operated as a boys' summer camp until 1966. Between Memorial and Labor days, this is the spot to catch the Island Runner Ferry to Burton Island State Park. Intrepid visitors might like to head up to Aldis Hill Park (with parking and access at the Hard'Ack Recreation Area) to romp around and, perhaps, to search for the sobering Franklin County wolf monument. This stone-slab memorial celebrates the alleged death of the region's last gray wolf, shot dead by Lawrence Brainerd in 1839. According to Obscure Vermont blogger Chad Abramovich, the marker is off-trail and not the easiest to find — perhaps ask a local for tips? 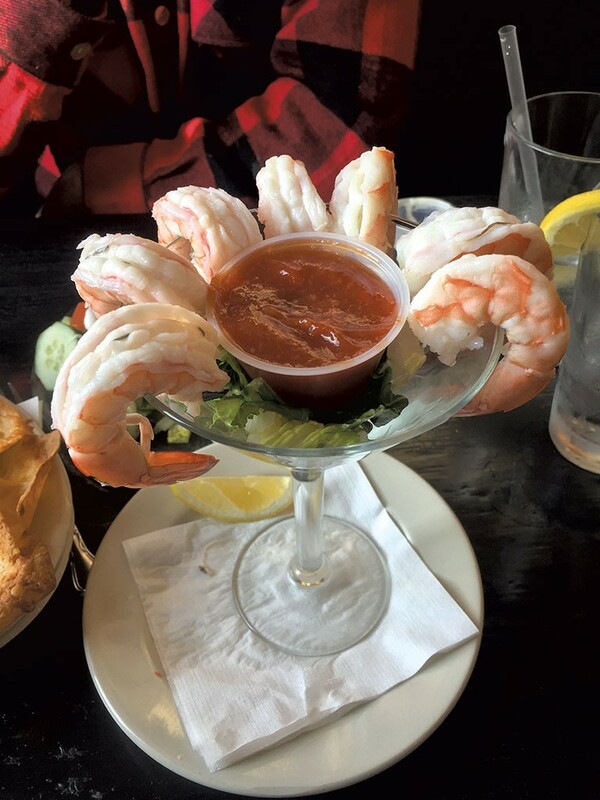 When you're ready for lunch, Jeff's Maine Seafood at 65 North Main Street is a popular favorite, with standard American fare and daily specials. Locals also recommend the Old Foundry, which was recently acquired by Katie and Jamie Foy and boasts outdoor courtyard seating. If you're feeling more casual or lighter on funds, the Traveled Cup (94 North Main Street) offers café eats in a homey atmosphere. Do stop for dessert at Evelyne's on Center, a sweet confectionary at 15 Center Street offering treats such as cappuccino brownies and ginger truffles. Walk off your meal by browsing Main Street's many shops. Artist in Residence (10 South Main Street) is an artist-run gallery space featuring works by dozens of local creators and craftspeople, from hand-turned bowls to textiles. 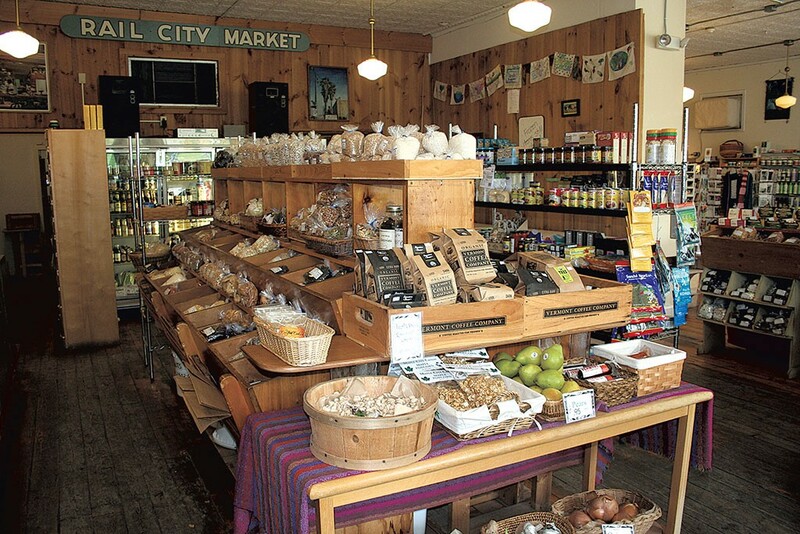 The charming Rail City Market (8 South Main Street) has an excellent selection of local provisions and lovely sundries, including jewelry, ceramics, and locally made cosmetics and bath goods. And if you're into woo at all, head to Moonshadows Gifts for the Spirit (72 North Main Street) to stock up on crystals, candles, incense and palo santo. For a leisurely, informal dinner by the water, get yourself to the Bayside Pavilion (15 Georgia Shore Road), an appealing waterside steakhouse that artfully straddles the line between local watering hole and tourist favorite. The outdoor deck is a luxurious spot to take in the sun — and sunset — while enjoying one of many home-style comfort foods, with plenty of seafood options. You would be remiss not to get a creemee after dinner, and the Bay Store (585 Lake Road) across the street from Bayside is ready to oblige. Along with standard chocolate-vanilla and black raspberry-maple twists, the gas station snack bar offers 24 other flavors and — get this — maple sprinkles, a cross between actual sprinkles and crumbled maple sugar. 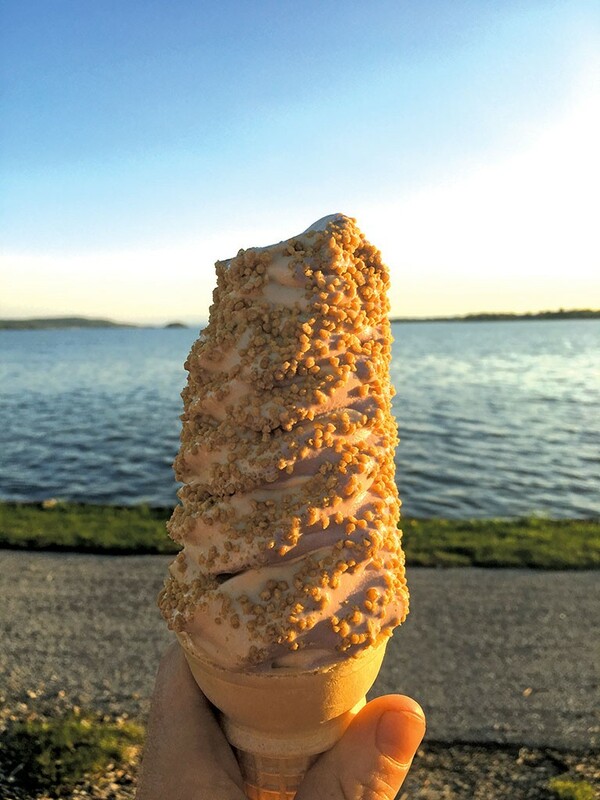 Look both ways, and take your creemee to one of the benches along the bay. It's nice. If you're not ready to retire for the evening, see what's playing at the historic Welden Theatre (104 North Main Street), downtown's three-screen movie house, which has been in operation since the 1940s. Movie or no, St. Albans has plenty of evening and late-night spots to grab a drink or three, assuming you're not driving. Locals recommend J.W. Ryan's Pub (42 Kingman Street) and Shooters Saloon (30 Kingman Street). The veteran-owned taproom at 14th Star Brewing (133 North Main Street) offers popular local brews such as Valor Ale, periodically enhanced with live music and food-truck fare. Wherever you end up, raise a glass to your day's adventure and, of course, to St. Albans — and get home safely. The original print version of this article was headlined "'Snalbins' Summer"
Tags: Culture, Summer Preview, St. Albans, Maple City Diner, Catalyst Coffee Bar, The Eloquent Page, Saint Albans Museum, Missisquoi Valley Bike Trail, Jeff's Maine Seafood, The Old Foundry at One Federal Restaurant & Lounge, The Traveled Cup, Evelyne's on Center, AIR Gallery, Rail City Market, Bayside Pavilion, Welden Theatre, Shooters Saloon, 14th Star Brewing Co.